After a soggy May it was time to pivot to summer with June's #WineStudio Session 35: Sonoma's Rosé Revolution. And indeed the revolution has spread throughout the valley and across multiple grape varieties.Wineries are using the two traditional methods for producing rosé, either gently pressing the grapes as in Provence or using the saignée or bleed from red wine production. This session featured four Sonoma wines: Passaggio Wines 2015 Rosé Merlot Sonoma; Ellipsis Wine Company 2015 Rosé of Pinot Meunier Sonoma County; Pedroncelli Winery 2015 Dry Rosé of Zinfandel Dry Creek Valley; and Angels & Cowboys 2015 Rosé Sonoma County (Grenache Rouge, Merlot, Petit Verdot and Grenache Blanc). I received a sample of the last two with notes below. Cheers. 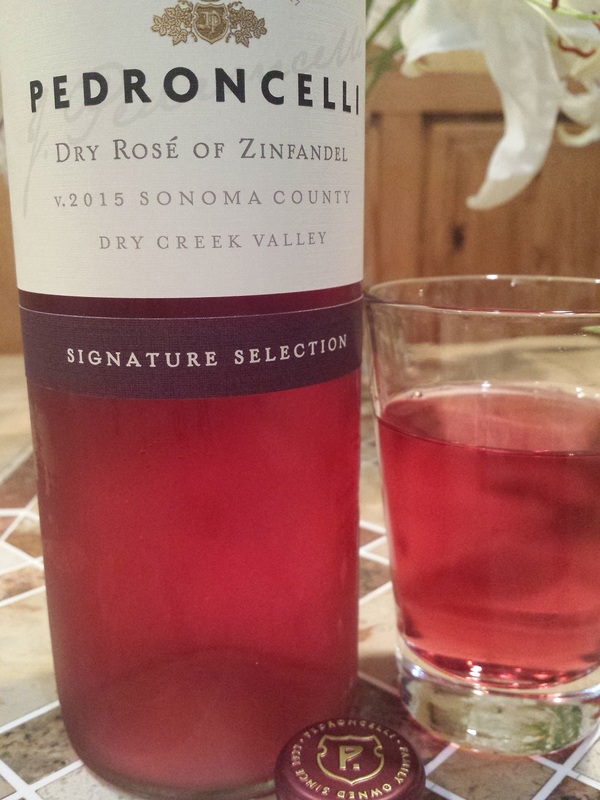 2015 Pedroncelli Winery Dry Rosé of Zinfandel Dry Creek Valley ($12). The grapes are harvested from prime Dry Creek Valley fruit, the Pedroncelli estate as well as Buchnignani vineyard. 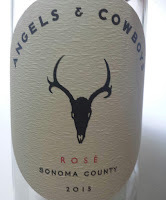 This rosé is made by combining both popular methods, the free run juice from early picked grapes (60% of the blend) and 40% saignée (juice which was drawn from the fermenting tank of fully ripened Zinfandel). 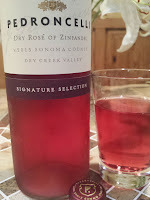 Because of the the fruitiness of the Zin, the wine feels slightly sweeter than dry (.4% R.S.) and looks like cherry gummy bears in the glass. The flavor starts with candied red cherries and a side of mint, but as the wine warms strawberries evolve, with the fresh acids persisting throughout. A simple, yummy, and refreshing wine. 2015 Angels & Cowboys Rosé Sonoma County ($15). The brand is a collaboration between Cannonball Wine Company co-founders, Yoav Gilat and Dennis Hill, and Northern California graphic artist, Michael Schwab. The wine is a field blend of Grenache Rouge, Merlot, Petit Verdot and Grenache Blanc sourced from vineyards in Carneros, the Alexander Valley and the Dry Creek Valley. The grapes are harvested early, lightly crushed and macerated on their skins as in the Provencal style. After a long fermentation at cooler temperatures the wine rests on its lees to increase the mouthfeel and texture. Unfortunately my bottle was consumed without my presence when friends visited, but here's what other participants had to say.